Murrays Beach is a residential community, nestled in beautiful native bushland, surrounded by the beautiful Wallarah National Park, on the lake front of Lake Macquarie, Australia’s largest inland saltwater lake. The 70 hectare area features beautifully landscaped, tree studded, grassed areas and native bushland, extensive cycle ways and walking tracks along the Lake Foreshores, undercover BBQ facilities, its own jetty and a resident only swimming pool for the residents to enjoy throughout the Summer months. Whilst it's quietly tucked away in the National Park, it's also conveniently close to shopping centres with Swansea shopping precinct ionly 5 minute's drive away with late closing Coles, Woolworths supermarkets, McDonalds, Subway, Butchers, Post Office, Newsagents, Dan Murphys, Cafes Hotel, Chemist, Doctors, Hairdressers and more! If you Swansea at the right time, you may even see the bridge over Swansea Channel open to let the large boats in or out of the lake. If you are after a large shopping centre, both Westfield Kotara and Charlestown Square are within a 30 minute drive from the property, both of these shops feature a number of specialty stores, restaurants and entertainment for the kids. If you want to stay closer to home, the Lakehouse Cafe sits within the grounds and is open 7 days for breakfast and lunch and available for dinner Friday and Saturdays evenings. El Large the Italian Restraurant at Raffertys Resort is also just a couple on minutes away. To catch a few waves or to explore the Beaches, Caves Beach and Catherine Hill Bay are also within 5 to 10 minutes drive. Murrays Beach provides it all, beautiful, expansive lakeviews, and pristine clear waters, native bush, birds and wildlife ... Miles form anywhere but close to everything. FREE WiFi. Communal swimming pool and amazing waterviews!! ... Sunset at Lake Point is a modern, beautiful 4-bedroom home, featuring bushland views which captures the peaceful surrounds of birds chirping and a nice lake breeze, the perfect spot to get the family away from the city and relax. Sleeping up to 8 guests, Sunset at Lake Point is a great place for families, romantic weekends away, friends, fishing weekends and just guests who want to escape to the lake. This well presented family home is located in the beautiful suburb of Murrays Beach. The main bedroom of the home features a King size bed, walk in wardrobe, ensuite with a spa bath and shower, plus access onto the back deck. The other 3 large bedrooms feature built in wardrobes and ceiling fans, one of the bedrooms has queen size bed and the other 2 have single beds (both with single trundle beds under them). The main bathroom features a shower and large bath. There is a third toilet downstairs. The large, open-planned entertainment area features a fully equipped kitchen with a large gourmet stove, dish washer, full size fridge, microwave and a butlers pantry with an extra bar fridge. You can enjoy a meal at either the breakfast bar or the dining table. 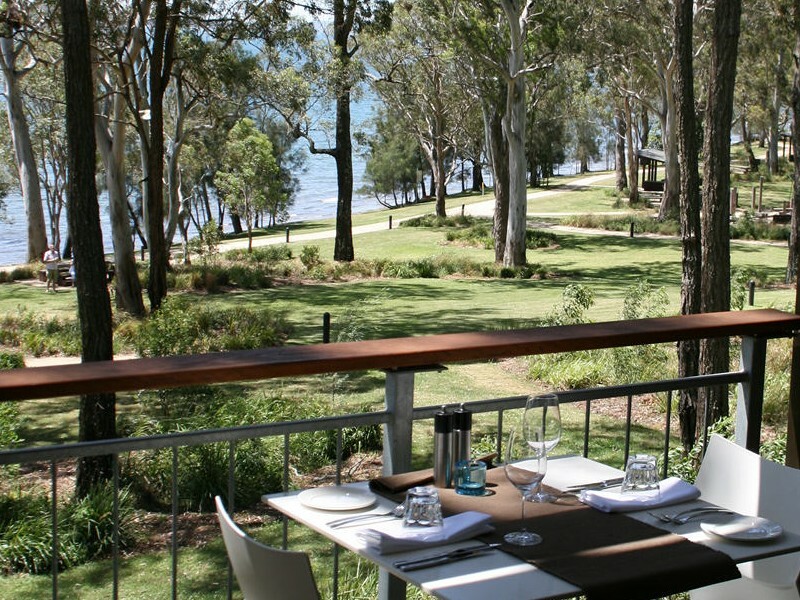 Or if you would like to take your meal outdoors, you can sit on the back undercover balcony and enjoy the peaceful outlook the bushland/lake setting has to offer, this is also a great spot to enjoy an afternoon beverage while you watch the sun go down over the lake. The living area has a large comfy lounge where you can sit and watch the smart TV which has surround sound or simply sit back and enjoy the cool breeze coming through the back-sliding doors. If your feeling a little cool, you can cosy up near the gas fireplace. There is plenty of parking for a car and boat in the double garage and driveway. There is a boat ramp less then 5 minutes away. The property also has a laundry with washing and drying facilities. Murrays beach is a bushland suburb located in the southern end of Lake Macquarie, while visiting you can enjoy a swim in the onsite communal pool, a scrumptious meal at the onsite lake café, a stroll along the lake, a picnic or fun on the kids playground.